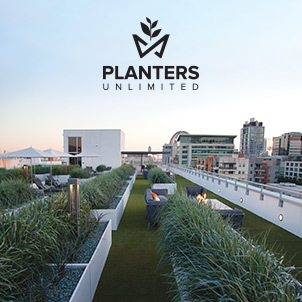 Planters Unlimited is known for its custom manufacturing capabilities and highly durable products. Its planters and landscape solutions are a top choice for the world's best hotels, resorts, casinos, theme parks, restaurants, and others who require their designs to be stylish, functional, and long-lasting. Choose from fiberglass, stone, wood, composite, and stainless steel planters, all constructed with internal reinforcement for added stability, and outdoor-rated materials that make them durable and long-lasting even in freeze/thaw conditions and harsh climates. Fully customizable, these planters can be made in virtually any size, style, or finish—choose from 25 colors and four unique finishes, including real metal. Oversized, self-watering, and watertight planter options are also available, along with brand- and logo-based designs and those that incorporate light and power sources. Ideal for city beautification projects, industrial-grade hanging baskets are also offered in traditional and modern styles, and an assortment of sizes, with self-watering options. Decorative wall panels, multi-functional storage and bench systems, space dividers, trash receptacles, and more are also available at www.plantersunlimited.com. Every day, people complain about the acoustic environments in the office buildings where they work. This is supported by the Center for the Built Environment at the University of California (UC) Berkeley, which maintains one of the most extensive post-occupancy building survey databases in the world. Overlays were born in the modern era out of necessity.1 When concrete needed to be refurbished and restored, but could not be elevated to the decorative concrete status, another material was needed to fill the void. For decades, Canadian urban development has been dominated by high-rise condo buildings, large apartment complexes, and single-family dwellings—without much in between.